On April 12, students in Conestoga’s Culinary Management diploma program hosted Rising Stars: International Tapas and Tastings at the Kitchener Market. Now in its third year, Rising Stars is a partnership between the School of Hospitality & Culinary Arts, Conestoga’s Centre for Entrepreneurship and the Kitchener Market that provides the college’s aspiring chefs and restaurant owners with a hands-on real-world experience. 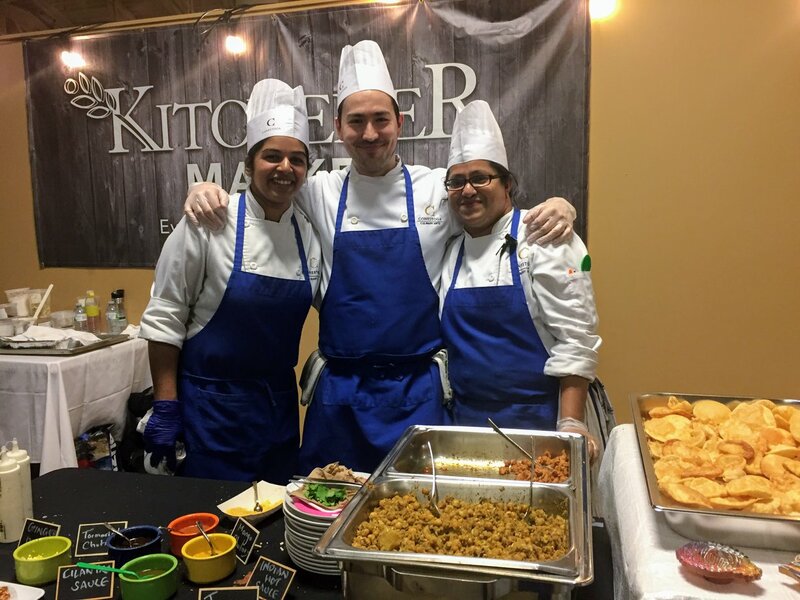 Culinary student Nuzhat Aman, right, worked with her team to prepare a selection of Indian street food for guests at the third annual Rising Stars culinary event at the Kitchener Market. The event was open to the public and featured a selection of tapas and street food from six countries. Using techniques taught in class, students planned and executed their menus, sourced ingredients and practised their communication skills while they interacted with guests. Among the featured tapas were confit cod and manchego croquettes from Portugal, Jamaican jerk chicken, bannock and braised elk from Canada, Korean bulgogi and Mexican tacos al pastor. She worked with her team to present classic Indian street food and started planning the menu with them a month ago. For two weeks leading up to Rising Stars, the team was involved with hands-on preparation that included testing and developing sauces. Steph Housworth and her team were assigned Canada for their theme. For her, Rising Stars was an opportunity to really explore the country’s cuisine and research Aboriginal recipes. Conestoga’s School of Hospitality & Culinary Arts provides a broad range of programs to serve the workforce needs of the growing hospitality industry. An expanded Culinary & Hospitality Institute currently in development at Conestoga’s Waterloo campus will foster innovation and entrepreneurship for the region’s burgeoning tourism sector. Scheduled to open in Fall 2018, it will provide a number of key benefits for students and the community, including increased capacity for the delivery of education and training, new programs based on local food heritage and culture, and applied research and professional development to support local industry. For more information, visit Transforming Together.